Kalan Haywood Sr., founder and president of the locally headquartered developer Vangard Group, speaks during the “fishbowl” discussion. Photo by Jabril Faraj. 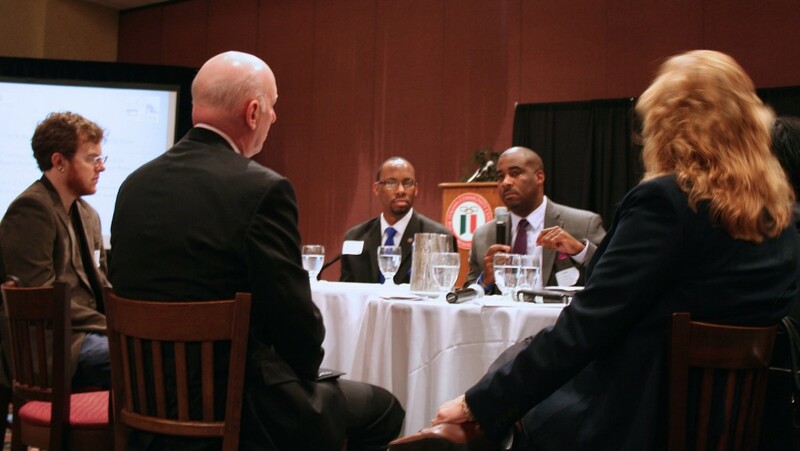 At a recent summit meant to tackle the high black male unemployment rate in Milwaukee, black leaders said the problem is rooted in racial discrimination, compounded by lack of access to job opportunities and lack of outreach to black communities and individuals. “[Equal opportunity] is a very basic principle — we all say we live by it,” said Ald. Ashanti Hamilton. “Matter of fact, we swear by it in this country. But, often times, we’re unwilling to admit that we have structures in place that were designed for the specific purpose of keeping folks out of the process.” Hamilton addressed a crowd of more than 150 public sector, nonprofit and corporate professionals. The summit, hosted by the Urban Economic Development Association of Wisconsin (UEDA), was part of an annual summit series. UEDA Executive Director Kristi Luzar said the summits, which have previously focused on transit and business corridors, are “outcome driven” and topics for breakout sessions (known as labs) are chosen through feedback from members, partners and the City of Milwaukee. Luzar said takeaways from the event will be incorporated in a city report that will inform the work of the Black Male Achievement Advisory Council and the federal My Brother’s Keeper Community Challenge in Milwaukee in 2016. Mayor Tom Barrett spoke of a “renaissance” in downtown Milwaukee, touting the new Northwestern Mutual development and future projects, such as the new Bucks arena, The Couture development and a recently approved streetcar project. He also noted some successes of the Residents Preference Program (RPP), which mandates 40 percent participation of underemployed and unemployed workers on projects that receive more than $1 million in direct financial assistance from the city. Barrett pointed out that, for many unemployed individuals, some of the best jobs are in construction. Barrett said the challenge is to “ensure that the people who live in this city, particularly in the economically distressed parts of the city, play a role.” He said the city has to do a better job of making sure the opportunities that are available are also accessible. In breakout group focused on 21st century skills, attendees brainstorm ways to address black male unemployment. Photo by Jabril Faraj. “There’s an economic imperative. There’s also a social and a moral imperative that we do a better job of making sure that people have an opportunity to support their families, just as we all want to support our own families,” Barrett noted. 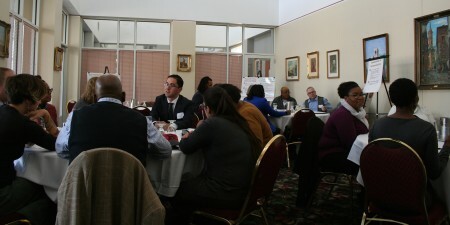 A mixed-race roundtable discussion that included professionals in academia, construction, healthcare and the public sector, attempted to unpack the issue, touching on the skills gap and exploring nontraditional educational pathways, thinking creatively about employing black males and addressing the issue of confidence. “Twelve percent of African-American males in Milwaukee have a college degree, versus 37 percent of white males … but only 11 percent of Latino males have a college degree and, yet, the Latino male non-employment rate is one third the black rate in Milwaukee,” said Levine. Shanyeill McCloud, of Clean Slate Milwaukee, which helps ex-offenders expunge their criminal records, left the summit halfway through because she said the people being talked about weren’t represented. But Haywood said there’s nothing better than going directly to the source; for example, doctors would always want to examine and speak directly to the person they’re diagnosing. This dynamic was on display in the entrepreneurship lab where Milagro Jones, a recent hire at Public Allies who has been homeless for the majority of his life and has been incarcerated twice, helped to steer the conversation. The session touched on the need to reach out to individuals where they are and the need for organizations working in the community to be accountable, among other topics. The summit was a positive experience for Jones, who said that in rooms full of professionals, he often comes in thinking that people don’t like him or want him there. “You could almost call it a paranoia,” said Jones. “I look like the people that I see being oppressed all over the world,” whether it’s someone who is killed by a drone or shot by a police officer and forgotten. “I feel unwanted; I feel unloved by society,” he said, adding that people working with black males in Milwaukee, “need to be honest with themselves … and stop trying to hide from the truth and the reality,” referring to the plight of many African-Americans. Rule, who came from an impoverished background, said he is grateful that he and Jones were able to connect, calling it a mentorship opportunity. “Today was a way for me to talk to him, for him to learn and for everyone who was in that room to understand what we go through on a daily basis,” he said, emphasizing that more interactions of this sort are needed. Oh poor guys its not your fault that you dont have a job. its everyone elses job to tell you about these jobs. You stay right where your at we’ll come to you and tell you about these jobs maybe bring you an application. Latinos have one third of of unemployment that african americans have with english as their second language in a different country. Who came to thwir neighborhood to tell them about job opportunities. The Corporate leaders need to realize they hold “the key” to successful community’s here in Milwaukee. Every successful community in Wisconsin has a high rate of working men and dads. Corporate Wisconsin can transform our communities of poverty, buy expanding their companies in the city. They historically expand in suburbans and rural communities or overseas. If corporate Wisconsin expects expert educators to change the way they teach and want to privatize schools as a way to address the high failure rates and lack of job ready skills, is it not logical for these same corporate leaders to bring jobs to the vary communities they invest in educational reform? If the thousands of dedicated educators and administrators can work with the children and youth in the communities of poverty and high unemployment, Corporate Wisconsin MUST do the same by dedicating their future growth in these same communities. Think about it! Educators and Businesses have to work together in the school buildings and outside of them. Together we can bring great learning and great jobs to communities of poverty. Neither one of these institutions can ever do it alone. Educators and school districts are dedicated and committed to staying in the Milwaukee communities of high unemployment and poverty. Can the citizens of Wisconsin expect the same from corporate Wisconsin? Never underestimate what public and private institutions can do for communities when they bring what they each do best to address issues of joblessness.